Both Antigua and Barbuda are almost completely surrounded by well-preserved coral reefs, walls, and shipwrecks. The southern and eastern coasts of Antigua and virtually the entire coast of Barbuda are surrounded by shelfs, providing excellent conditions for spectacular shallow diving and snorkeling. There is little or no current in most places, and the water temperature averages about 80 F (25 C). Underwater visibility ranges from 50 to 140 feet, and tropical marine plants and animals are diverse and plentiful. Snorkeling is possible at many of both islands' most beautiful beaches; one of Antigua's best-known offshore sites, Cades Reef, is now partly contained in a designated underwater park. Another popular destination is the wreck of the Andes, a three-masted merchant ship that sank in 1905 and now rests in less than thirty feet of water in (ironically enough) Deep Bay. Antigua's dive facilities are far superior to those available on smaller Barbuda, and so most of the sites that have been established as dive destinations are Antiguan. The southern and eastern coasts are considered to offer the most consistent diving; for more advanced divers, the ledge of Sunken Rock on the south coast is a popular site. Dive depths generally range from 25 to 80 feet and can reach 180 feet; distances from shore to site are in some cases no more than five minutes and at most 40 minutes away. Barbuda's encircling reefs contain an enormous number of wrecks, most of which are yet to be explored; in fact, the Codrington fortunes on Barbuda were intimately linked to their acquisition of rights to the wreckage in the 17th-century. To dive off Barbuda, it is best to make arrangements with a dive shop on Antigua to have the necessary equipment taken over by air or boat. Jolly Dive is located on the beach at Jolly Beach with easy access to Antigua's finest dive sites. 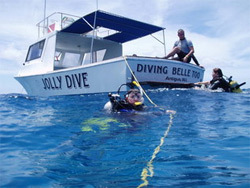 Operating from Jolly Beach in Jolly Harbor for over 25 years, Jolly Dive is staffed with both PADI and NAUI professional scuba diving instructors. Diving excursions Monday through Saturday with Sundays available upon request. P.O. Box 149 Jolly Harbour, Antigua, W.I.